You know WordPress is a terrific CMS—or Content Management System— for small to medium size websites but so many themes look so, well, so bloggy. No Worries. You can use the power of the Thematic WordPress Theme Framework and Travailler, a Thematic Themelet, to turn WordPress into a smart-looking, easily branded, professional website with whip-smart typography and design. All you have to do is upload a theme. Easy. Click on the big Travailler screenshot below for a fully functional demo and take a look at a screen-capture of a sample site I quickly worked up. Then come back here and read on to find out more about why you should start using Travailler right now. What’s a Themelet? Travailler is a Thematic Themelet. That means Travailler requires the Thematic Theme Framework installed in your WordPress theme directory. Thematic powers Travailler. And Travailler builds on the power of Thematic. But don’t worry! Thematic is free. Even better, it’s open-source and one of the most advanced WordPress themes around. Download Thematic now and set your blog on a rock-solid foundation. Are you ready to build a professional, state-of-the-art website in minutes? Using everyone’s favorite, easy-to-use CMS, WordPress? Check out what Travailler can do for your small business website. There’s not a lot it won’t do (and what it doesn’t you might just not really need). I take WordPress theme search engine optimization very seriously. We depend on our WordPress themes to help us get found. And if you can’t be found, why are you on the Web? That’s one of the reasons I’m grateful to have something like Thematic to base Travailler on. Because Travailler takes advantage of the SEO power of Thematic you can be sure that you’ll always have a super-charged, search engine ready website. 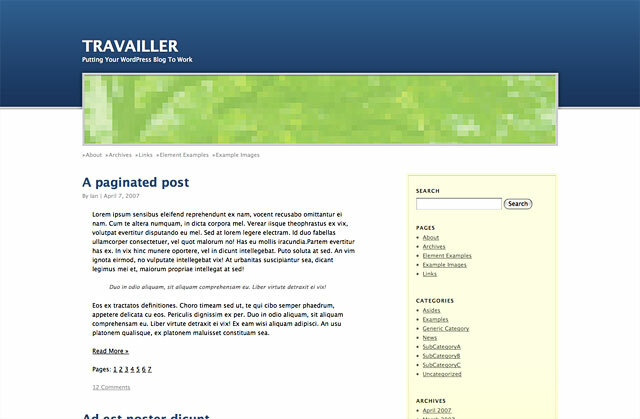 The Travailler theme is ready to be easily re-branded to fit your corporate image. And I mean it. It really is easy—thanks to the WordPress Custom Header API. Just navigate to the design section of the WordPress admin and the Custom Image Header page that appears when Travailler is the active theme. From this page you can browse to a file on your local computer, upload it and even crop it to fit the dimensions of the theme. In a matter of seconds you can have an image specific to your company up on your site—without touching any code. See? It really couldn’t be easier. Travailler is clearly lacking in one thing: goofiness, bloopiness or kruft. Every design element has been carefully considered for maximum visual capital and effect. The rest? It’s been pared away. Leaving you with one of the few WordPress themes for your small business that you can actually use for a small business. Because Travailler is powered by Thematic it’s extremely easy to modify and upgrade. When a new version of Thematic comes out, just upload it to your themes directory, overwriting the existing version, and Travailler won’t be affected at all. That’s the magic of a Thematic Themelet. Travailler leverages WordPress Child Theme capabilities to protect itself against upgrades. And if you want to make CSS changes to Travailler, that’s easy too. Just make a new folder in your wp-content directory called “travailler-variant” and save a file to it called “variant.css”. Travailler looks for this file and it’s here that you can start overriding the look of the theme with your own custom CSS—without messing up the original files. The same goes for adding new functions to Travailler. Just create a new file in “travailler-variant” called “variant.php”. You can use this file just like you would functions.php in any WordPress theme. Bonus: If you want to get started with your own Travailler variant, download my sample variant theme. On top of that, Travailler has a host of Widget-Ready areas. Giving you an unusual—and likely appreciated—level of control over your site layout. Speaking of modifications, who likes to have theme credits in the footer of your corporate website? Anyone? I didn’t think so. Because the Travailler theme is Thematic-powered you can modify the footer information from the Thematic Options page in the WordPress admin area. You can even add your own custom information here. Leaving the credit in the footer is appreciated—but not necessary. No special licenses to remove the link in this theme. Just go ahead and do it if you feel you have to. To be perfectly honest, I really like Travailler. I think it’s a really good, professional WordPress theme. And I think you will too. It’s built on the Thematic WordPress Theme Framework and it’s easily branded. It has built in future-proofing for easy customization and a professional design. Download it now. And let Travailler help you build your website. After exploring a handful of the articles on your site, I truly appreciate your way of writing a blog.